ACTION ALERT: Save Bill and Lou! At the end of October 2012, Bill and Lou, the hard-working team of oxen for Green Mountain College’s Cerridwen Farm, are scheduled to be slaughtered. 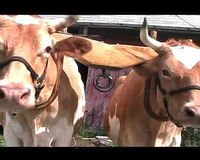 Bill and Lou have worked as draft animals on the school’s farm for over ten years. They have provided many services for the college and are mascots and friends to many students, past and present. Since Lou sustained a recurring injury to his left rear hock, he no longer has “value” to GMC, so they decided to purchase a new team and send both of these oxen to the slaughterhouse to be "processed" (euphemism for killed) for their meat. Please encourage Green Mountain College to allow Bill and Lou to be adopted by the VINE Sanctuary in Vermont where they can live out the remainder of their lives. They've worked so hard for the college for 10 years and deserve a better fate than ending up on someone's plate! Bill and Lou deserve better! Please sign the petition and send an email to lend your voice to the campaign to save Bill and Lou from slaughter and allow them to live in peace at the VINE Sanctuary!